So they are picking on the cheeeldren now? The little brats will have to leave the playground before grabbing a quick drag? They can't have a smoke in the car on the way there, and now they can't smoke when they get there? I suppose that is fair enough – it will get them used to the vilification they can come to expect in later life. I am intrigued by this concept of "smoke free spaces" though. I can see that working within the confines of a building all right but how is the smoke supposed to know it can't enter a playground? It's akin to the concept of Ireland being nuclear free and expecting the radiation to respect that when Sellafield blows up. 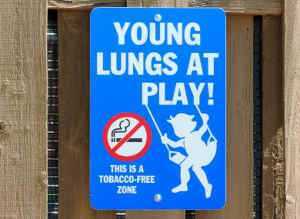 Are they going to box in all the playgrounds so that the smoke can't get in? Or maybe they'll box them in to stop the smoke getting out – can't have them pesky kids polluting our fresh clean air which we have a right to? I'm also still a little puzzled over the concept of "denormalisation". I have done a little research on this and have discovered that "denormalization" [with a Mercan spelling?] is a method of optimising [with an English spelling!] a database to improve read performance and reduce disk access. You can read the full explanation here. Now that is simple enough, but how on earth does it apply to smokers? Are they padding me out with spurious data to allow me to be read more efficiently? Do they really think I'm a relational database? To the best of my knowledge, none of the lads [or lasses] in the village who smoke look any different. In fact they all look distinctly un-different, so what exactly are the signs of "denormalisation" that I should look for? I have even asked a few of them if they are normal or otherwise and just get strange looks in return. How will I know if and when I have been denormalized? Will I start wearing skirts and odd shoes? I already wear odd socks – no missing sock syndrome here – so is this one of the first signs? Will I start walking backwards everywhere? I find it all rather confusing. Does anyone else find this conjures up some pretty nauseating images, or is it just me? Considering that statistically a child is infinitely more likely to be injured by the equipment than by a whiff of burning leaf, then I think Elf and Safety should be concerned. You'd better phone them. The sign says 'This is a Tobacco-Free Zone'. Does this mean that the cheeeldren are free to smoke non-tobacco products? Either that or tobacco is provided free? Anyhows, they just have to step outside for a drag, or else take up vaping. Surely you know that there is a blanket exemption worldwide for the back of bicycle sheds? Even if the shed is in a playground, the back of it is still sacrosanct. Maybe they should build bicycle sheds in pubs? This is Lateral Thinking of the highest order: 'build bicycle sheds in pubs'. Get that idea quickly to the headquarters of the Irish Vintners Association, Grandad! Well thats eased my mind.bicycle shed it is then! Hey…I'm not you, Ger. I'm the one and only Ger. Everybody else is a pseudonym. Heh! Split personality? More than one Ger? Imposter? We are not amused. Can you please psyche us out or we'll go in two opposite directions?